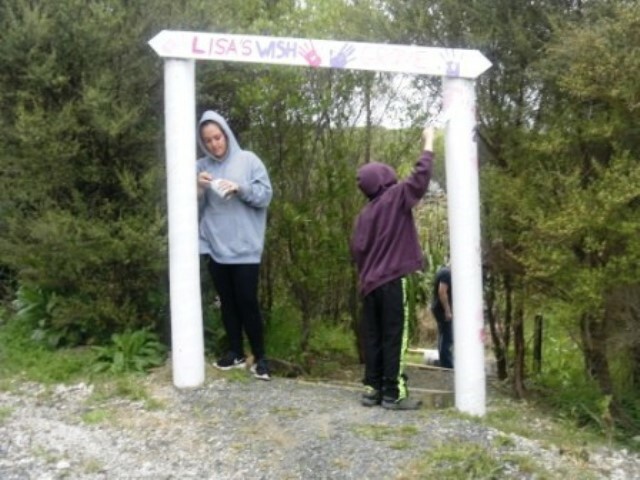 Lisa’s Wish Charitable Trust (LWCT) was conceived by the late Lisa Knapman-Smith, a wife and mother who passed away from cancer in 2009. 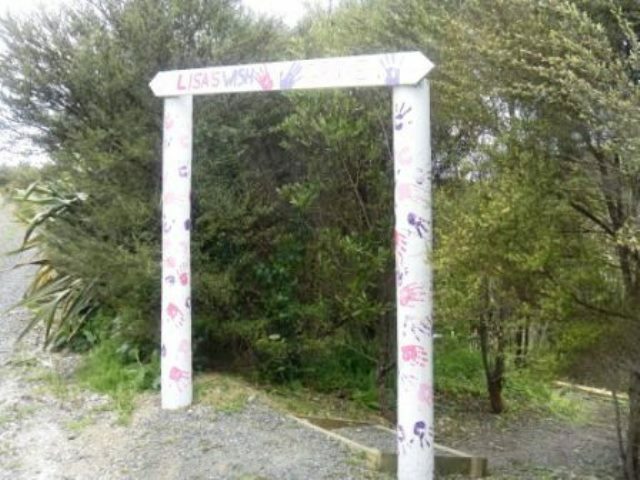 Since 2015, the trust and the Knapman-Smith family have been holding events at CUE Haven and have created the Lisa’s Wish Grove, which has become one of the most iconic features of the CUE Haven landscape. 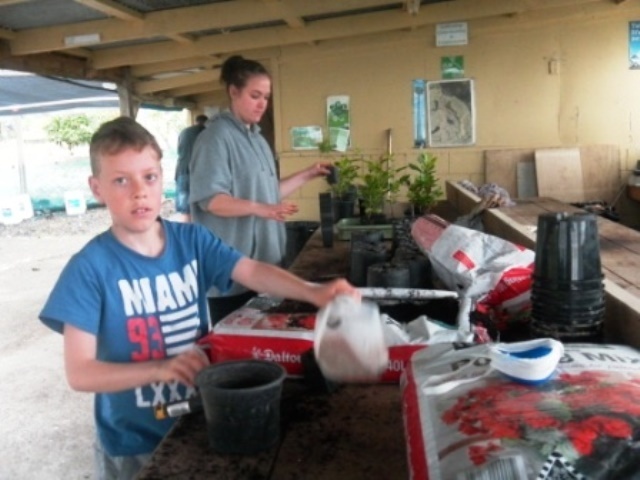 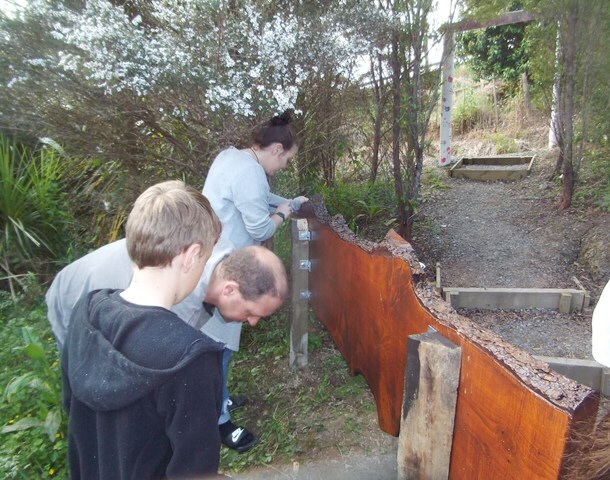 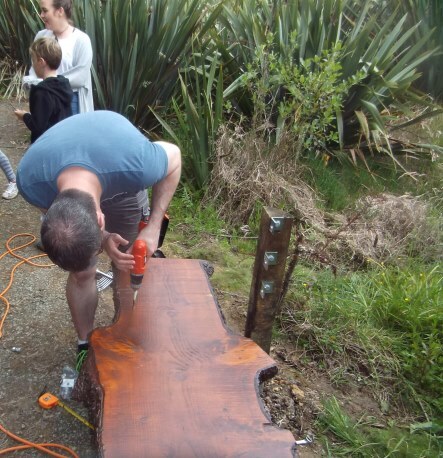 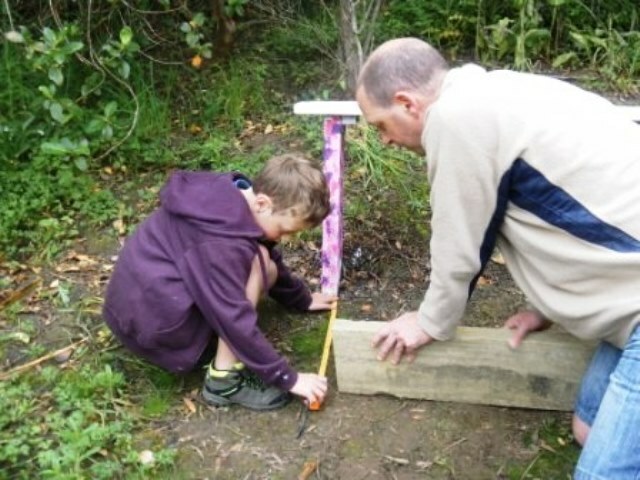 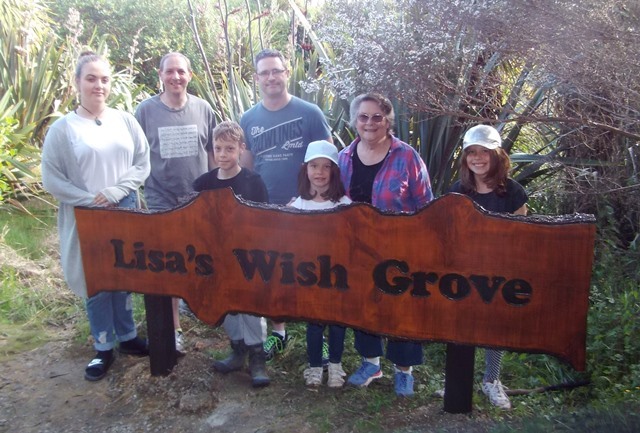 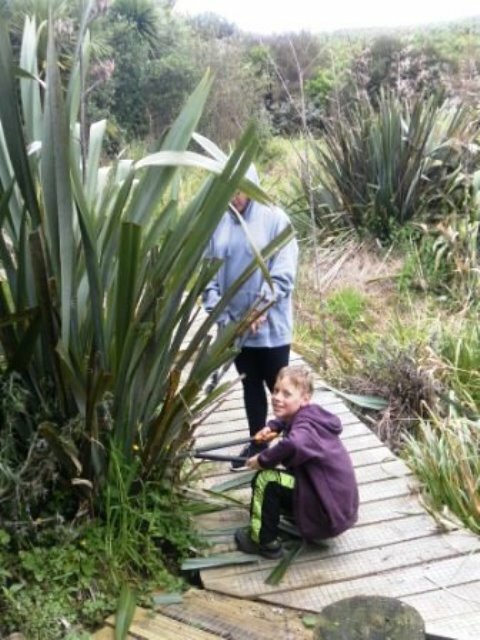 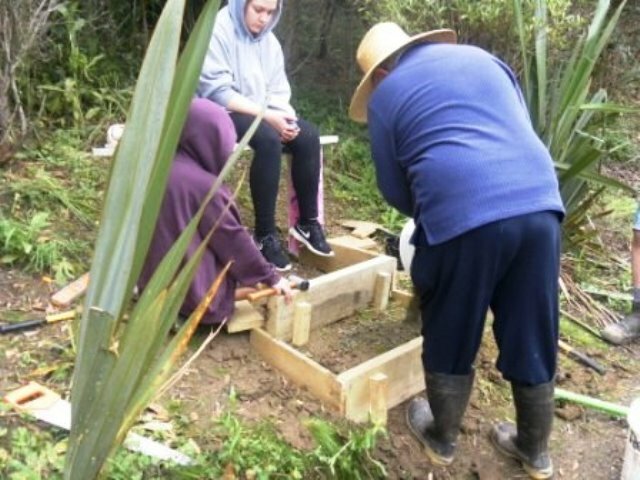 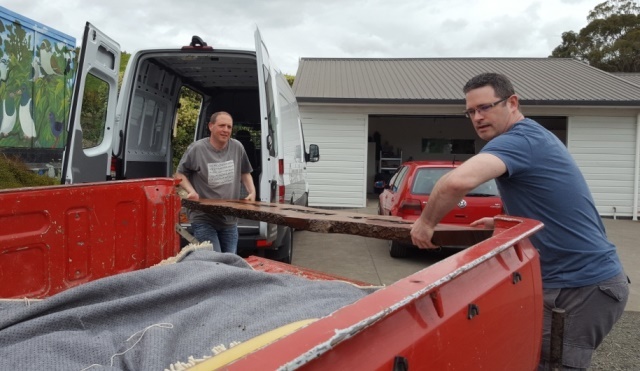 Rosemarie Knapman-Smith has created a new sign for the Lisa’s Wish Grove and last month, the family – Ian, Rosemarie, Neil and children Nikita and Cort, spent the Labour Day weekend at CUE Haven to do some maintenance in the Grove and to install posts for the new sign. 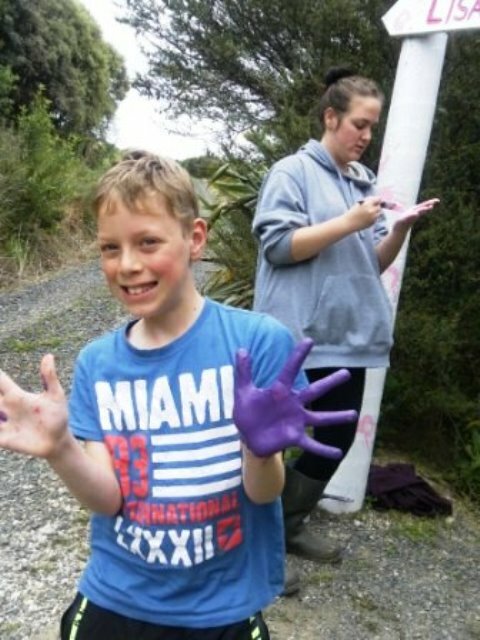 They tackled several big jobs. 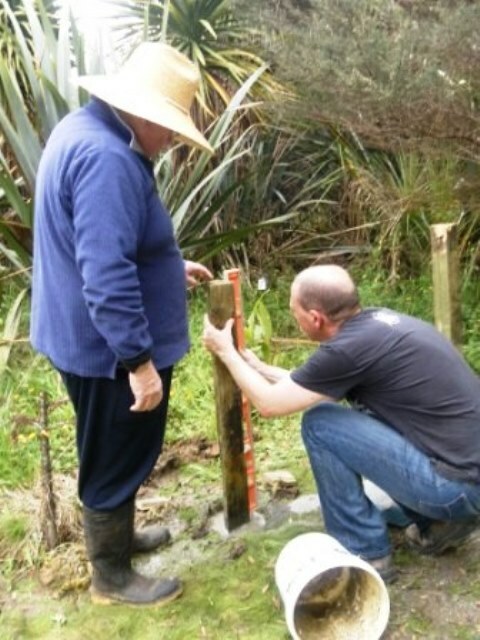 The first was identifying where they wanted to put the new sign and installing posts to hang it on. 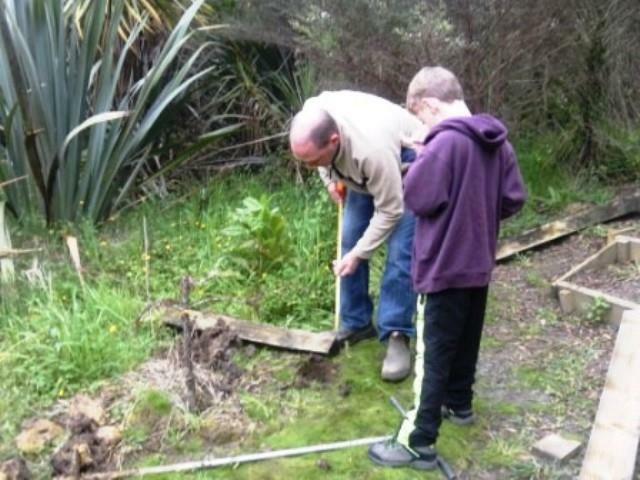 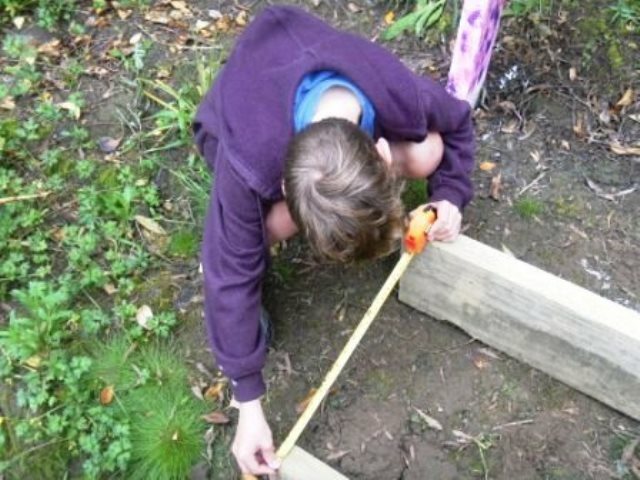 The work involved a lot of digging and measuring. 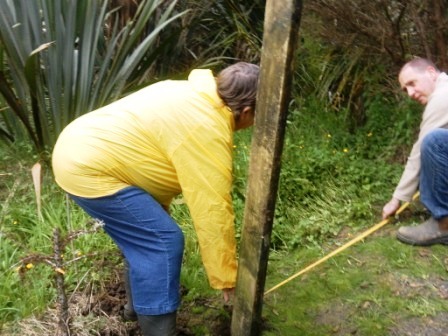 It was first necessary to determine how deep to dig the post holes. 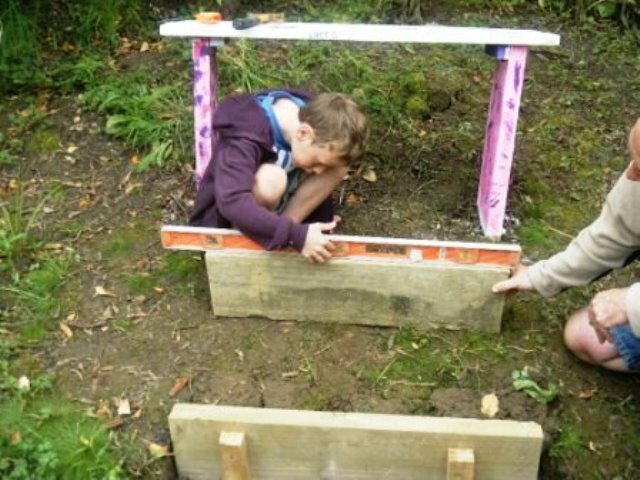 Once one hole was dug, the location of the next hole was determined. 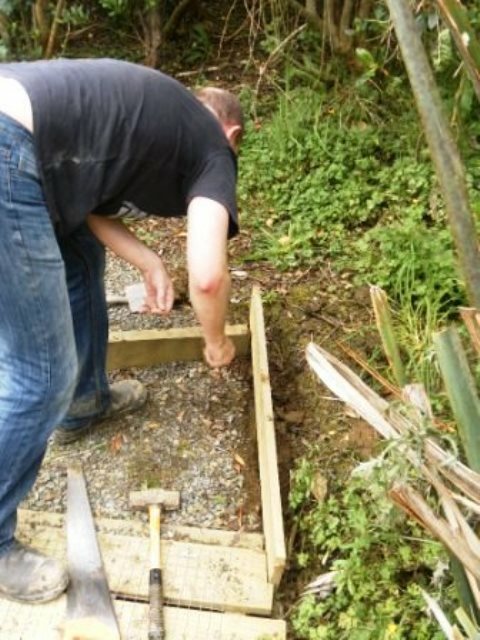 The posts were cemented in place and the alignment checked carefully. 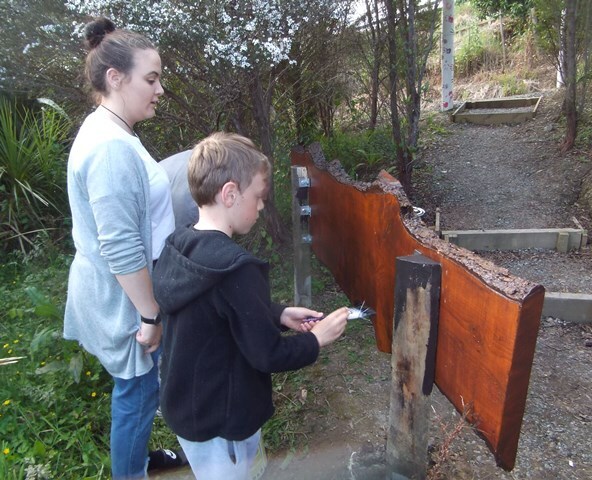 The new sign wasn’t yet finished and would be installed at a later date. 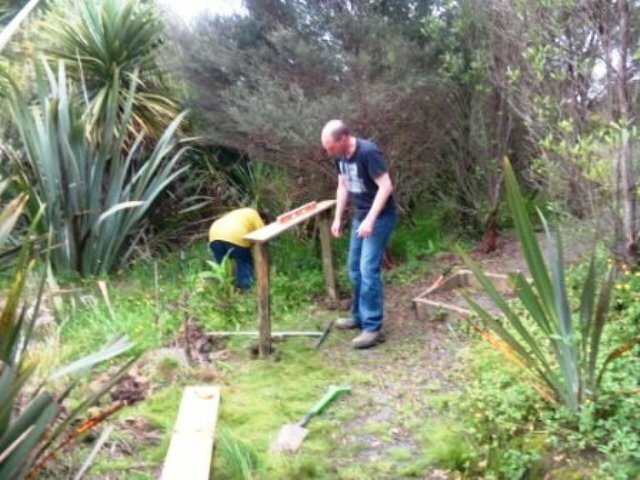 But the family labored away with other tasks this weekend. 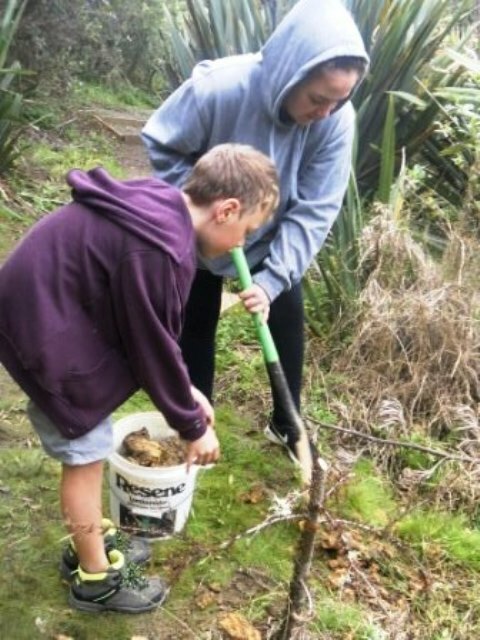 They did some weeding in the Grove. 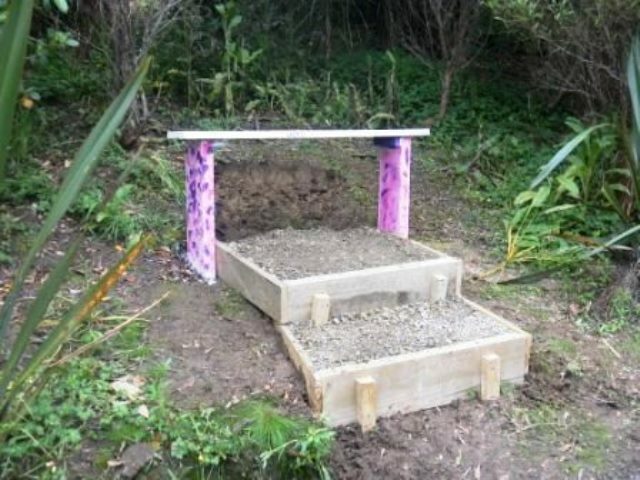 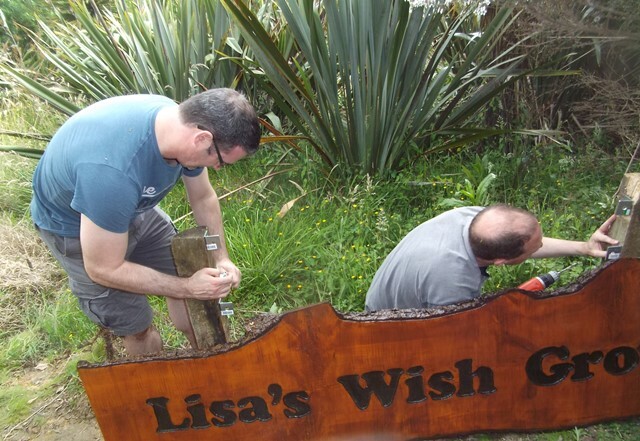 They also worked on the walking track in the Lisa’s Wish Grove, improving some of the steps. 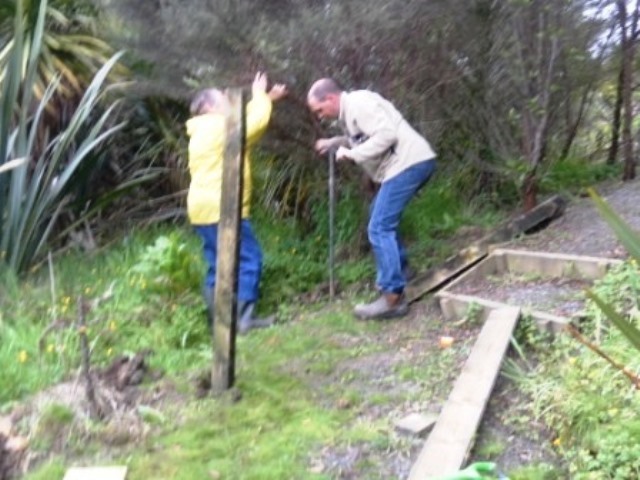 And Cort helped Ian build a set of steps up to the bench to make it easier for visitors to reach it. 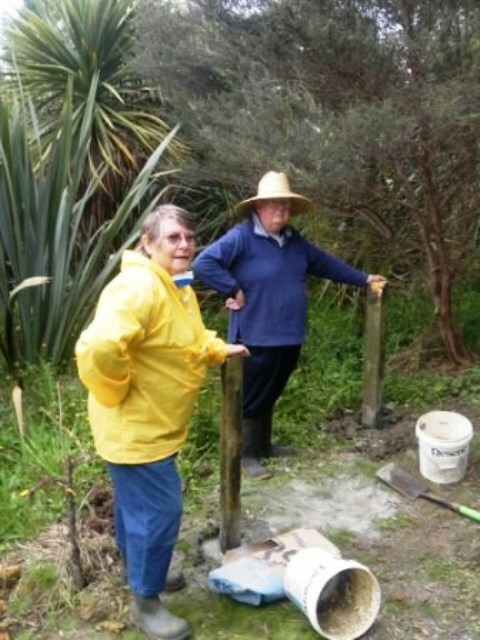 The new steps are a great addition to the Grove and will make it much easier for visitors to access the bench. 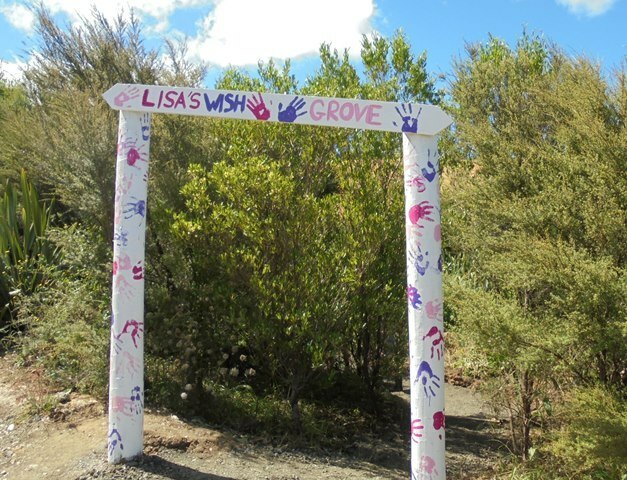 The last big job they took on was repainting the Lisa’s Wish Grove arch—always a messy but fun job. 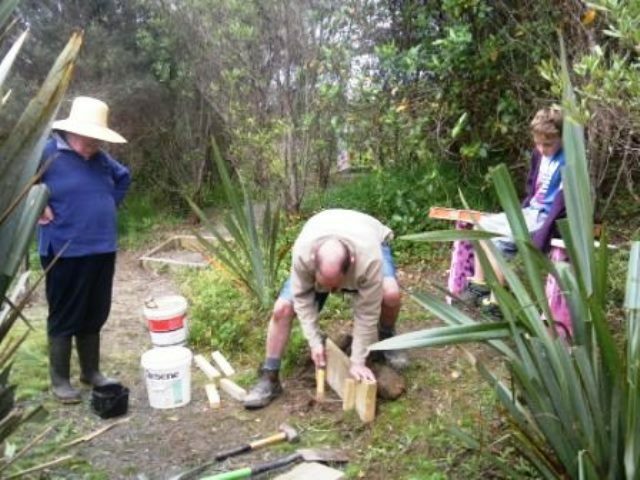 Everyone worked really hard and it was a very productive weekend. 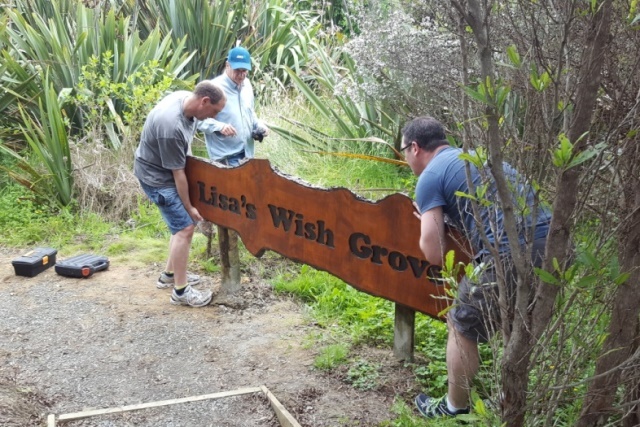 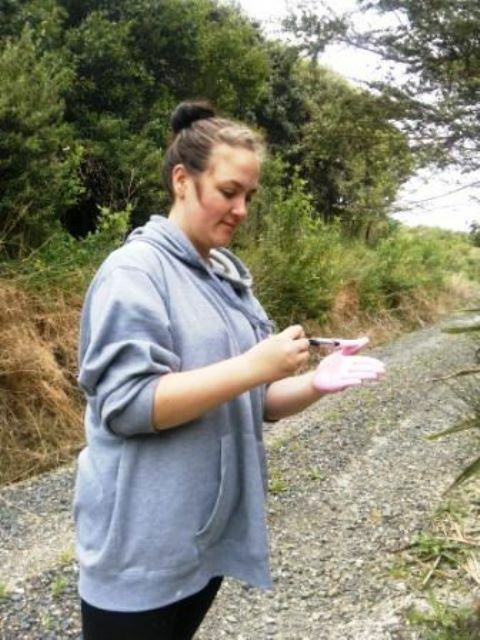 Thanks to their efforts Lisa’s Wish Grove is looking better than ever. 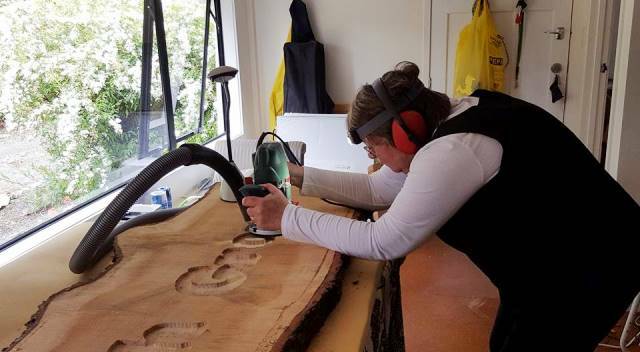 Over the last couple of weeks Rosemarie completed work on the sign at home – carving the letters, sanding it smooth and then staining and polishing it. 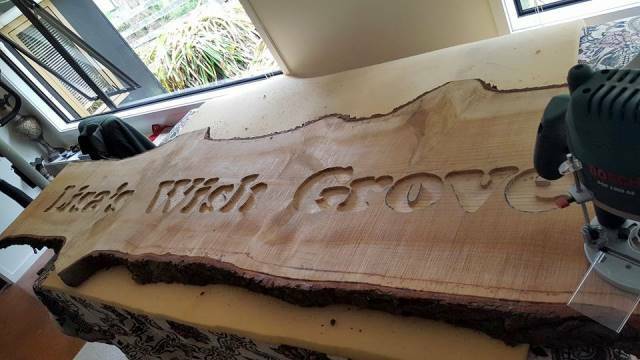 And this weekend the beautiful new sign was finally ready and installed. 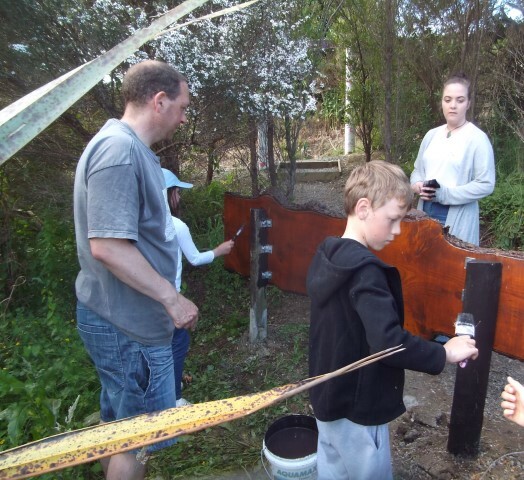 Rosemarie, Ian, Nikita and Cort returned with family friend Jason and his daughters Kaitlyn and Ashley with the new sign. 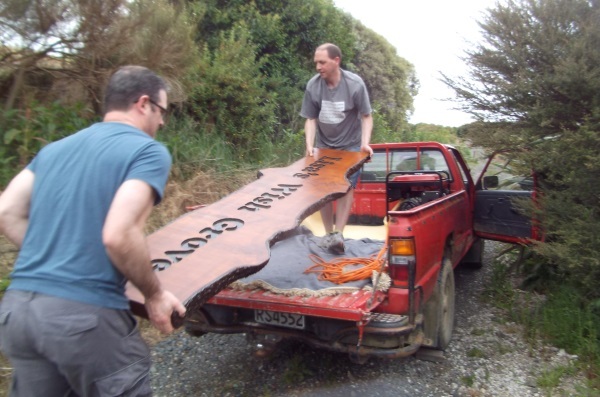 The first challenge was getting the huge sign down to the Grove! 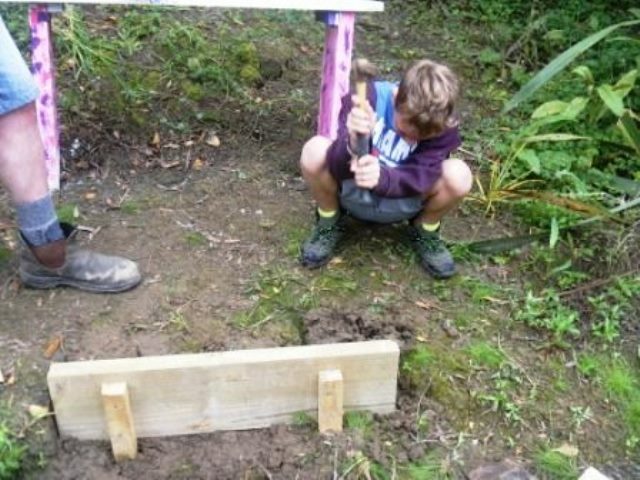 We then remeasured everything and figured out the best way to approach attaching the sign to the posts which had previously been installed. 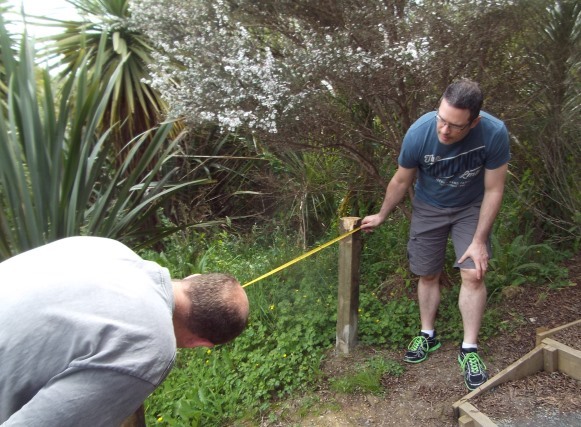 We test fitted the sign to mark exactly where to install the mounting hardware. 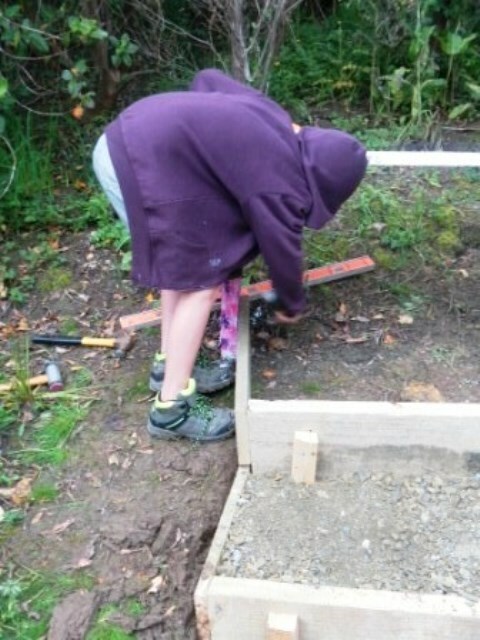 The hardware was installed with a lot of drilling and wrench-turning. 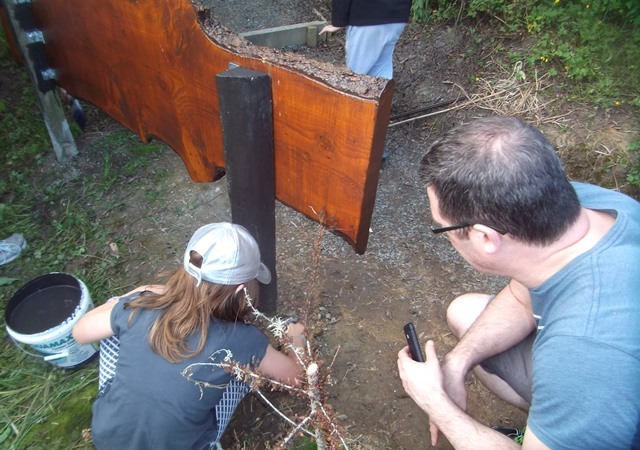 And with a lot of helping hands we positioned the sign so we could screw in the mounting bolts. 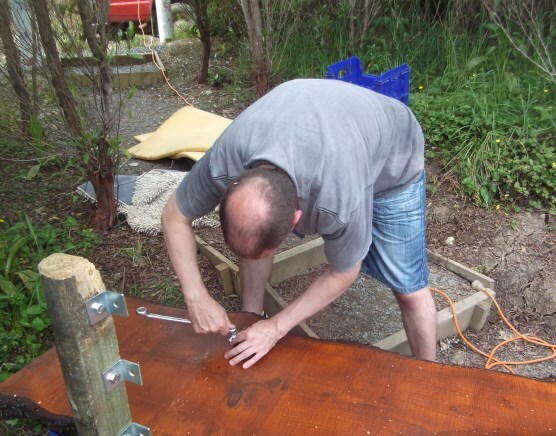 In no time, the bolts were all tightened down and the last task was to paint the posts. 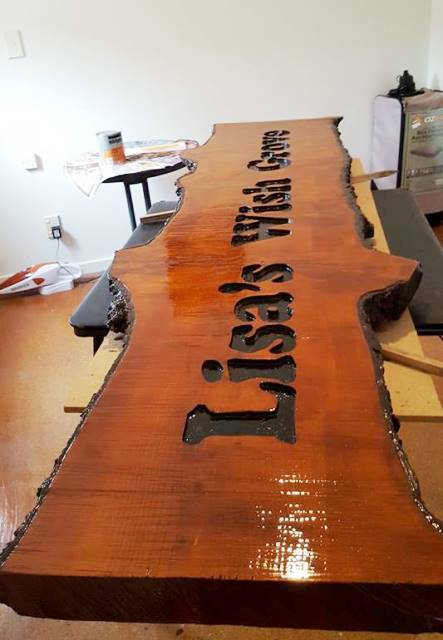 The completed sign is beautiful and a fantastic addition to the Lisa’s Wish Grove. 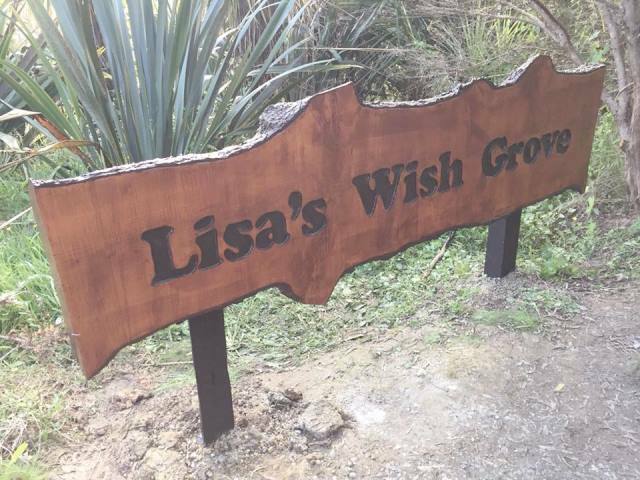 A big thank you to Rosmarie for designing and creating the sign and many thanks to all the Knapman-Smith family and friends for their hard work developing and maintaining the Lisa’s Wish Grove. 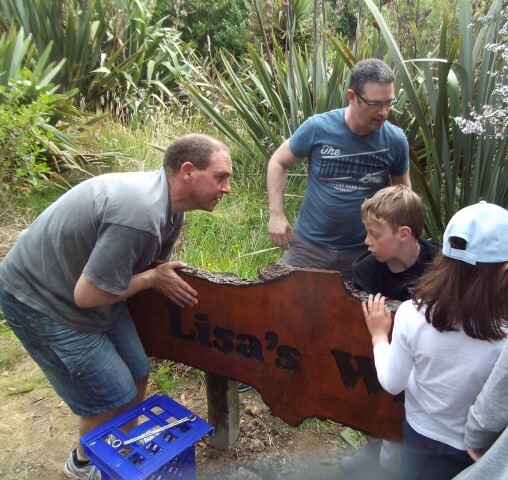 And our heartfelt thanks to the Lisa’s Wish Trust trustees and the Knapman-Smith family and friends for their support over the years and their very generous contribution to CUE Haven. 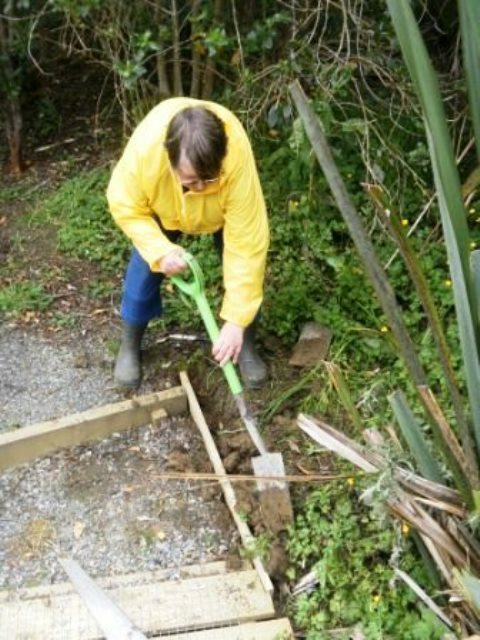 It is much appreciated. 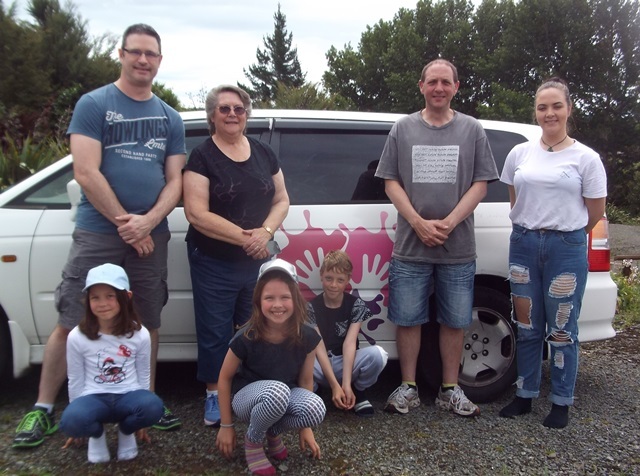 We have really enjoyed your visits to CUE Haven and we look forward to our continued relationship over the years and having you back often at CUE Haven.